Donald Trump said he may attend the opening of a controversial new US embassy in Jerusalem, a fraught prospect designed to underscore close ties with Benjamin Netanyahu, as he hosted the Israeli leader at the White House on Monday. 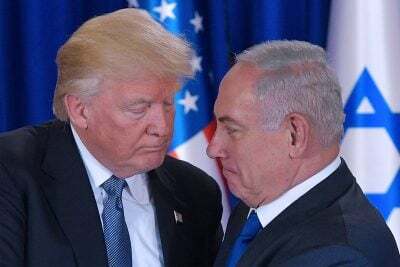 In the Oval Office, Netanyahu praised Trump’s highly contentious decision to move the embassy to Jerusalem – which both Israel and the Palestinians claim as their capital. Such a visit would risk pouring gasoline on an already inflamed situation and curb US claims to be an independent broker in the peace process. But Monday’s meeting was all smiles at the White House as the two leaders – both facing serious legal investigations – put on a joint show of unity. Hours before Netanyahu arrived at 1600 Pennsylvania Avenue, it was confirmed that an ex-aide agreed to become a state witness in a corruption probe that has imperilled his premiership. In his encounters with Trump and at the AIPAC conference, he was expected to focus mainly on Iran as Israel’s greatest enemy, and one he says seeks a permanent military presence in neighbouring Syria. Also speaking at the AIPAC conference on Saturday, Guatemala President Jimmy Morales announced that he would be moving his country’s embassy from Tel Aviv to Jerusalem on May 16, two days after the America’s planned move.